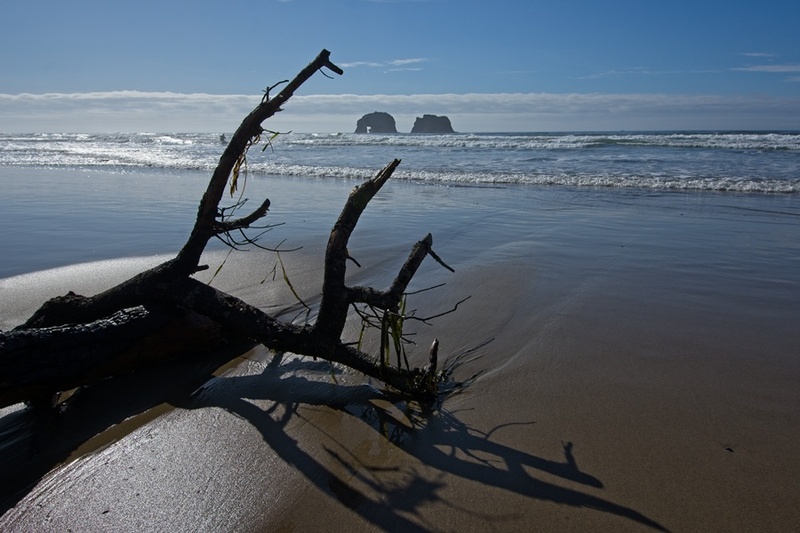 You’d think, living only a couple hours drive from spectacular ocean shores, that we’d spend more time enjoying them. But no, it tends to be out of sight, out of mind, and sometimes it calls for a more obvious prompt to get us off to the beach. Last fall the call of the not so wild whacked us alongside the head; a niece and nephew who live on the east coast flew out to Oregon, rented a house in the little coastal town of Rockaway Beach, and invited their parents (from the Portland area) and their daughter (from the Seattle area) to join them. My wife and I crashed the party, staying at a nearby hotel the first night and at the house the second night. Rockaway enjoys a long sandy beach, perfect for a leisurely stroll, accompanied by the soft roar of the surf rolling in. White noise, fresh sea air, and idyllic views calm even the most frenzied mind. The birds like it too. Sea stacks dot offshore Oregon. 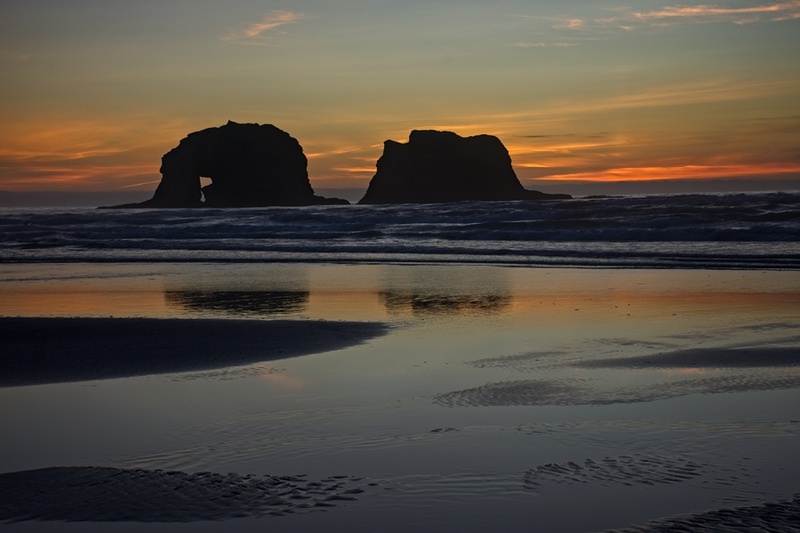 At Rockaway Beach there are two, bearing a name that reflects the imagination of the pioneers: Twin Rocks. (I bet those guys were fun at a party). 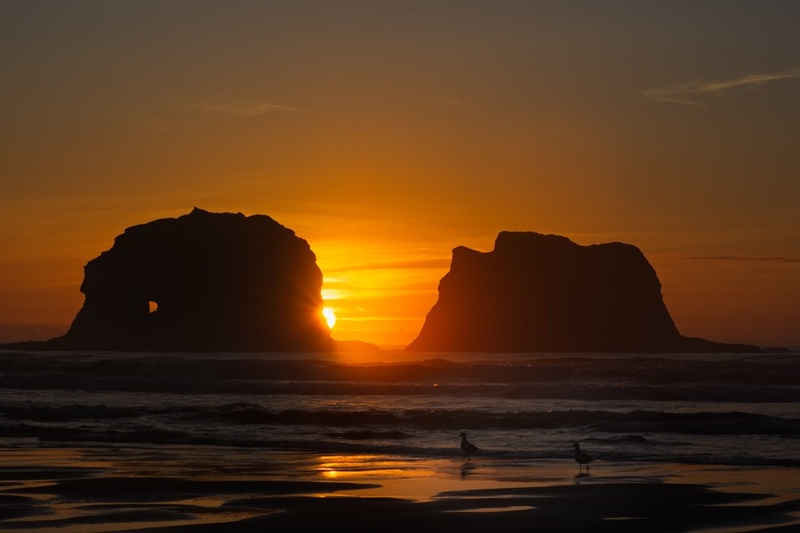 One of the rocks contains an arch, through which from the right angle, at the right time of year, a telephoto lens can frame a sunset. This wasn’t that time. Between the beach and housing, a natural levee of sand dunes topped with grasses provides both a barrier and an elevated lookout up and down the beach. Further south on the beach, we encounter a small river running into the ocean, complete with a collection of driftwood. An industrious crew spent time building the frame for a rustic beach house. An ocean view, a river view, rough-hewn timbers, a bed that molds itself to your form: what more could you ask? Ok, ok, so you wake up with sand in every nook and cranny, morning dew covering the sand, and sand fleas drinking the dew, but you wanted to share it with friends, right? Speaking of friends, we were there not just for the beach, but to spend time with kith and kin. Sharing walks and evening campfires on the beach, smores, stories, and other excursions gave extra depth and enjoyment to the outing. We didn’t just stick to Rockaway Beach. 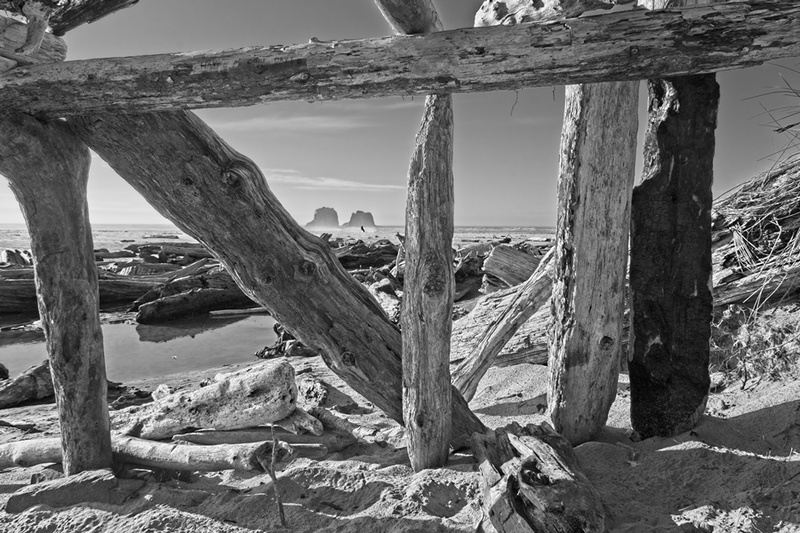 We visited Manzanita to the north, as well as Garibaldi, Tillamook, and Oceanside to the south. Some of you may have heard of Tillamook due to its cheese, but if you’re going to swing by the cheese factory it’s the ice cream that gets the oohs and aahs. There’s something almost primal about watching that brilliant ball of light descend over the horizon, where it seems to extinguish itself in the ocean. You’d almost expect a huge cloud of steam to rise. And what is that cloud deck but a cloud of steam, cooled to the Goldilocks zone? The gulls know the truth of it, and the sign of rains to come. After the sun goes down most of the beach visitors retreat, thinking the rite of passage is done and the show is over. They miss the blue hour. There’s a magical time after the sun has gone below the horizon but still lights the sky that the world reveals itself in shades of blue and violet. Winds often calm, and a sense of peace reigns while the earth tucks itself into bed, rocking away in its cradle, relaxing for a night of rest before renewing again for another day. Fantastic photography! I love especially the sunset pictures. Thanks, Peter. Sunsets do tend to be crowd pleasers, in pictures or in person. Nice place to hang out, isn’t it Curt? Somehow I didn’t manage to squeeze in dinning at Grumpies, or the hint of Milky Way we caught the first night, but it still brings me back too. Grumpies was anything but, Dave. Some fun! Wow! Beautiful. OK, I’m sold, what a beautiful shore. Slightly different atmosphere from the Far Rockaway in Queens. And this post is just outstanding escapism, I totally stopped thinking about when the ice would melt off my socks, this was a miniature vacation. 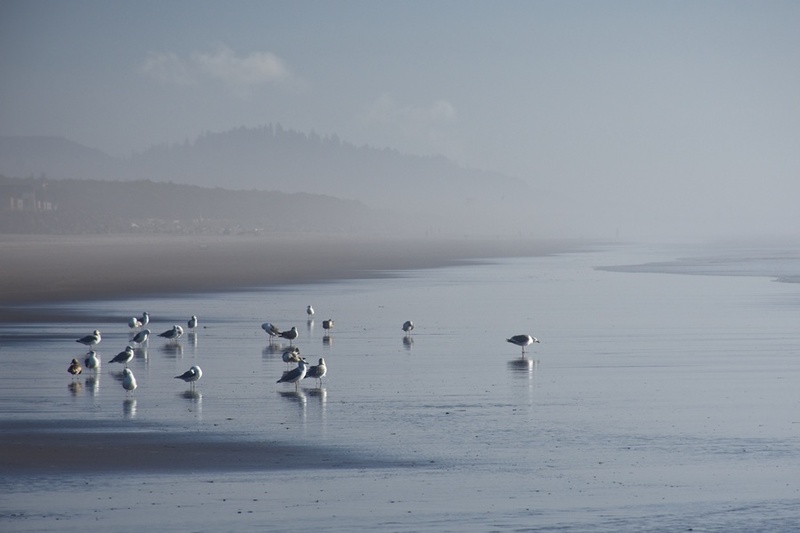 I’ll find a soundtrack of waves and seagulls, to drown out the space heater under my desk, and just leave it up on my screen for the whole day. All the photos are excellent, I like the painting effect on the shot with the grasses, and my favorite is that deep blue final shot. I’m happy to provide escapism in such a trying time. For me, it’s generally the toes that make up the ice cubes within the socks, dealing with frost on the outside as well demonstrates true survivalism. Now how could you have waited all these months to post the brilliant photos here?! Seriously, I count these among your very best, and it’s a sweet, simple story of time with friends and family. A winner of a post! I suppose it helps that I’ve only been posting every couple weeks. Even so, my backlog of pictures is dwindling fast, I don’t tend to shoot much in the winter. Maybe I should post fewer pics, more often. Anyway, I’m glad you enjoyed them – thanks for stopping by. Wow, Dave. Stunning from start to end, in both words and images. Those sunset photos are magical. I’m inspired to stay for the blue hour next time I catch the sunset at the beach. Thanks for this wonderful escape on a rainy day in Vancouver! Thanks, Kelly. It’s pretty soggy down here today as well. It was nice revisiting those beach memories, including the sunsets when the predominant color of late has been grey. This was perfectly dreamy, Dave. Loved every minute, most of all that shot of blue. This might be a great time to get a deal on the driftwood shelter, as it’s so wet right now the fleas have probably drowned. In the meantime, we can all dream of nicer days. Just beautiful, Dave! The photography, the party crashing and the family moments. Love it. The beach was great. Having family around made it even better. It really is those experiences shared that make memorable moments… and those, in turn, are what a family history is made of, to me. Perhaps I think of it that way because my hubby and I have been out west, separated from family, and raised our kids entirely without regular doses of extended family (for 30 years)… and so those special, shared moments with extended family were rarities to be treasured. I hear you about the “separated from family” bit, my immediate family is wide spread these years and I rarely see them. The coast trip was with family on my wife’s side, but I’ve been part of that extended one long enough now to feel like I’m part of it. Gorgeous shots, Dave. Is it your rhyme at the beginning, too? Thanks, Mick. The rhyme is mine; it’s a spin on an old nursery rhyme/lullaby – Rock-a-bye Baby. What a serene space. Simply beautiful. Thanks for stopping by, Jolandi. I always wonder, after spending a day at the coast, why I don’t do it more often. Nice play on words for that old song, Dave. The photos and words transported me to that seashore. The vintage grass/sky photo and the sunset and blue hour photos are my favorites. Maybe you won’t wait for family to motivate you for another visit? Funny how we often neglect what’s in our own backyards. Writing this piece and swapping comments about it have been transporting me back to that seashore as well. 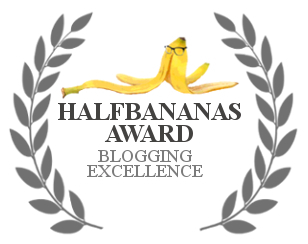 Maybe that’s one reason we blog – it gives us a chance to enjoy a place or event again. Hi Dave. Love your sense of humor, as always. That first image cracked me up perhaps more than usual. Have a cool day? Hahaha! At any rate, thanks for sharing your thoughts and impressions about this recent visit. I really enjoyed the images. 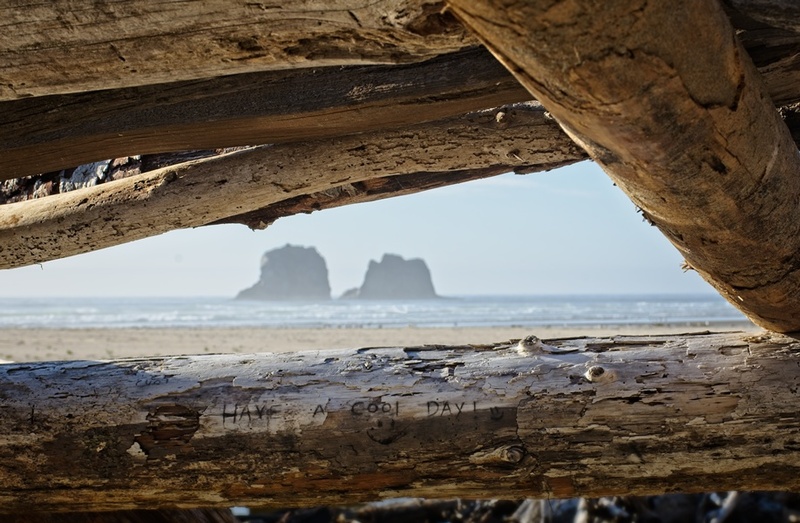 It was right there, inscribed into the log – how could I pass it up? It’s not often that the scenery literally talks to you. Glad you enjoyed the pics. Ah, nothing like the Oregon coast. You really captured the serenity of the place. Strange as it may sound, it’s not as scenic as some of the other beaches around so it doesn’t get as much attention. The Twin Rocks are on the south end of town, apart from that it’s mostly flat beach. Yes, I like the one you put in your banner best and featured toward the end. Last fall, huh? I don’t think I’ve been down there since last January, a year ago..but hoping to go back soon. 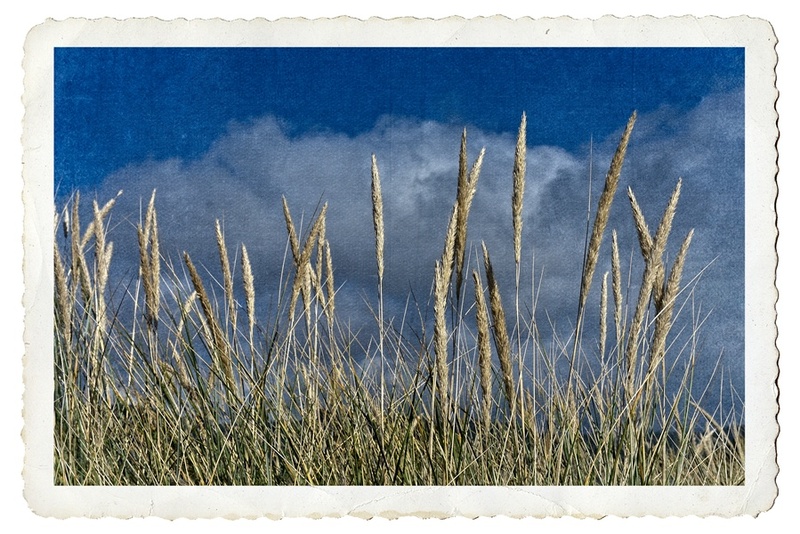 I like it in the winter if you can find a dry day, the subtlety of colors between the sand and light blue, all good. Thanks for reminding me how much I need to go back there. Just 75 minutes from Portland, I think! I’m dreaming of buying a used Mercedes and driving out there soon maybe with a little something in my picnic basket. It sounds like you had a really nice time with the extended family – I’m envious! Your commentary is so well written, and entertaining to boot. And the photos, especially that last one!! – what a pleasure. Your blue hour shot is divine. Weekend trips to the coast are one of our favorite pastimes, but have been in short supply the past couple of years. Fortunately, we’ve got a place booked in Lincoln City next weekend and I cannot wait! Guess this is one time I can tell someone to go fly a kite and not be rude about it. 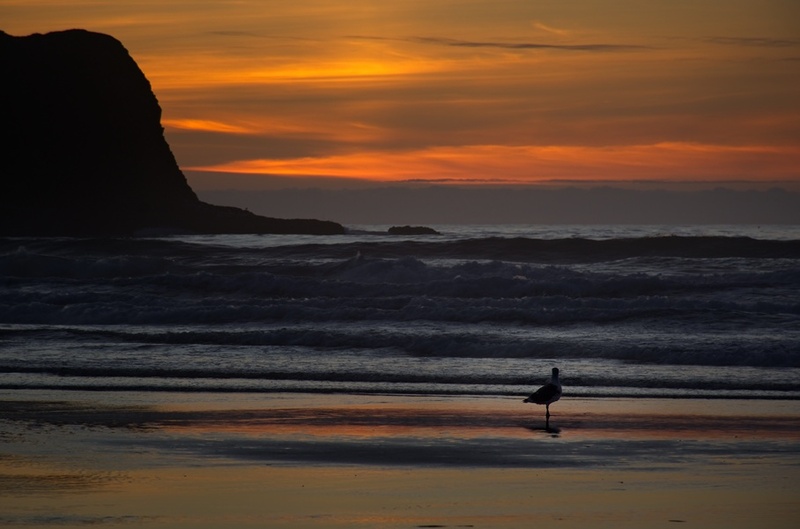 We haven’t been to Lincoln City for several years, enjoy your trip! I believe Goonies was shot in Astoria, Oregon, a bit further up the coast. Really, the whole Oregon coast is scenic. Wow! I loved the picture of the sun disappearing. Just when I thought it was over you stunned me with that picture of the blue hour. Is the faint shining object in the sky (last pic) the moon? Beautiful and truly magical. Your photography has truly evolved! I guess it’s not by accident that pro photographers recommend shooting at gold hour/blue hour (the hours preceding/following sunrise/sunset. The light and colors are softer and more dramatic. I’m usually too lazy to get up before the sun, and am not often at a good spot for sunset even when traveling. Shooting a sunset on the coast (when the colors and weather cooperated) was a rare pleasure for me. Beautiful coast. Beautiful photos. Happy you decided to crash your niece and nephew’s getaway party. 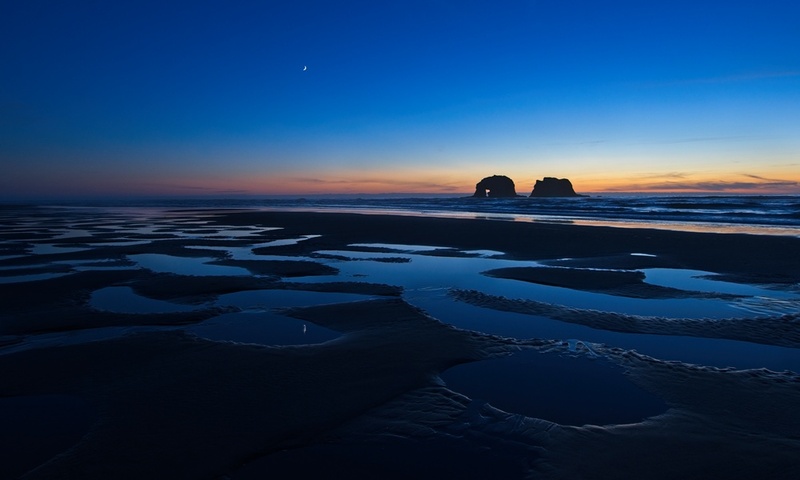 Think your readers will be demanding you take more trips to the coast after these photos. Thanks. 🙂 I should demand I take more trips to the coast!